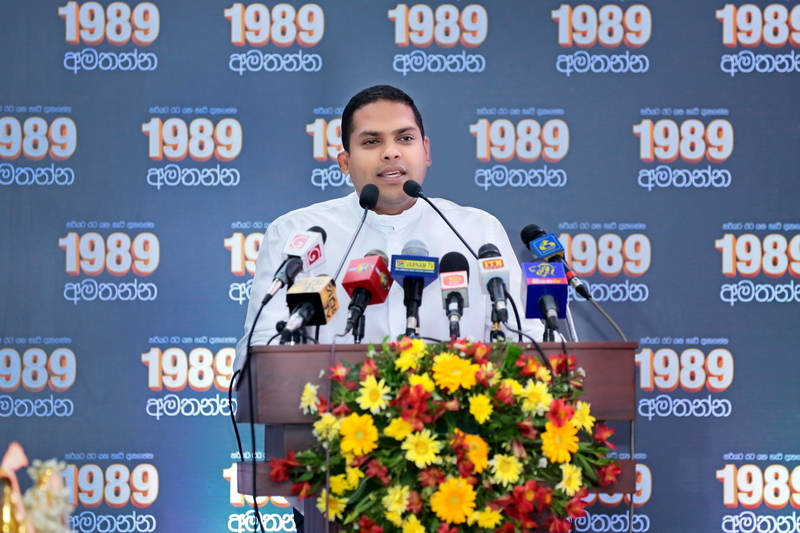 On the 28th of January 2019, the Ministry of Telecommunication, Foreign Employment and Sports launched the National Media Campaign on Safe Labour Migration at the Duncan White Auditorium of the Ministry. Implemented in collaboration with the Sri Lanka Bureau of Foreign Employment and supported by the Embassy of Switzerland in Sri Lanka, the campaign aims to encourage all citizens to make informed decisions and follow correct procedures for foreign employment by seeking proper guidance through reliable sources; the 1989 hotline, SLBFE Offices and Development Officers of Foreign Employment based at every Divisional Secretariat and District Secretariat office. The launch was attended by Hon. Harin Fernando – Minister of Telecommunication, Foreign Employment and Sport, and HE Hanspeter Mock – Ambassador of Switzerland to Sri Lanka along with senior officials of the respective organizations. The campaign will build awareness about getting correct information that will guide prospective migrant workers. It also emphasizes the necessity of registering with the SLBFE prior to departing. In addition, the sources provide advice and facilities to help them build a secure and successful future in the country of their choice, such as information on vocational skills as the improvement of skills and qualifications will improve job prospects, income earning potential, and working conditions, and long-term investment plans. Approximately 2 million Sri Lankans are currently working overseas, representing nearly 10% of the total population of the country. The majority of migrant workers are low-skilled construction and domestic workers working in the Gulf countries, who are particularly vulnerable to exploitation and abuse. Foreign remittances, primarily from migrant workers, continue to be the largest source of foreign exchange earnings for Sri Lanka, contributing 8.5% to the country’s GDP. “Labor migration has evolved into a very important topic in world politics. A vast majority of the people migrate for better employment, education or other opportunities, for the betterment of their lives and the lives of their families. Migration not only benefits the individual and his/her family but, also the country they’re coming from and the country they are going to. However, while labor migration is highly significant to a country’s economy as well as to the standard of living of many families, it has become increasingly evident that the difference between making migration work and being exploited often comes down to making informed decisions. The Safe Labor Migration media campaign seeks to reach out to all Sri Lankans across the island, to encourage and persuade them to think twice before migrating for employment and to ask all the important questions pertaining to skills, employment opportunities as well as the consequences for the potential migrant and their family. Switzerland is one of the front-runners in migration development at the global level. Our commitment within the system of the United Nations shows this clearly. Switzerland supports and encourages the stakeholders of the countries of origin and destination countries to collaborate in order to improve the conditions of labor migrants and their families, because it is our understanding that both have a shared responsibility towards migrant workers”, stated His Excellency Hanspeter Mock, the Ambassador of Switzerland to Sri Lanka. “It gives me great pleasure to be here to witness something that I have always wanted to do, and with the support of the Embassy of Switzerland, this goal has become a reality. According to the controversial stories we’ve been hearing, I believe it all comes down to effective communication to all our citizens to let them know which route to take in their journey towards migration. Another significant aspect, in my opinion, are the varying laws of each county. The SLFBE has being doing a fantastic job but it’s a job that does not receive much praise. In the 13 countries we represent at the moment, we have our foreign employment offices and safe houses, which are all in place to serve the needs of migrant workers. Most probably due to the lack of awareness and the people not knowing whom to contact when it comes to matters of migration. Unfortunately, due to this lack of awareness, many people do not register themselves at the SLFBE, thus when an incident occurs, it becomes quite a challenge for the bureau to aid them and bring them back to Sri Lanka. I believe that this is the ideal platform for such a campaign and I’m very thankful to His Excellency the Ambassador of Switzerland for the support rendered by the Swiss Embassy”, stated the Honorable Harin Fernando, the Minister of Telecommunication, Foreign Employment and Sports.